Picked up the next issue of ALL-STAR COMICS at the 7-11, quite possibly at the same time that my brother got SUPERMAN #299. This was a no-brainer, as I was already a huge Justice Society fan. 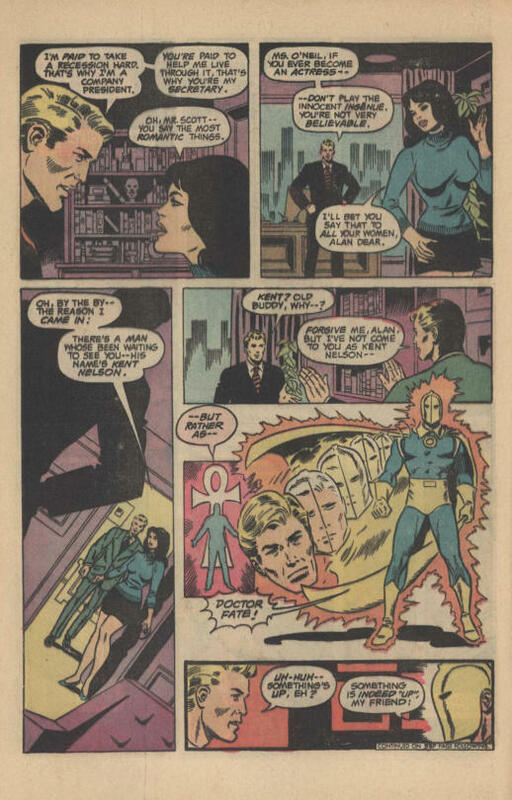 The whole affair is very much trying to be more like a Marvel comic, likely the influence of writer/editor Gerry Conway. Ernie Chua/Chan’s action-oriented cover is also very much in that mold. It’s one of his more successful efforts, though Star-Spangled Kid looks like he’s about to brain himself on that enormous block of logos and stuff at the top–but that can’t really be laid at Ernie’s feet. 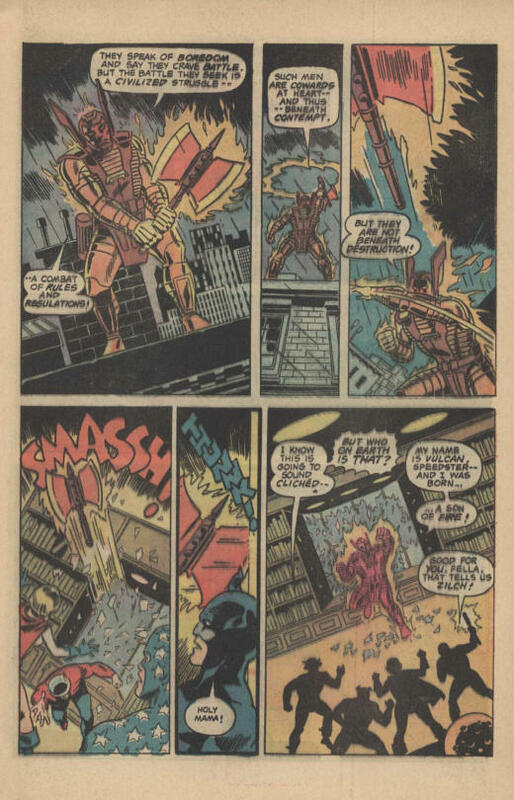 On the interiors, a young and just starting out Keith Giffen provides the pencils or breakdowns for the issue, in one of his first assignments. 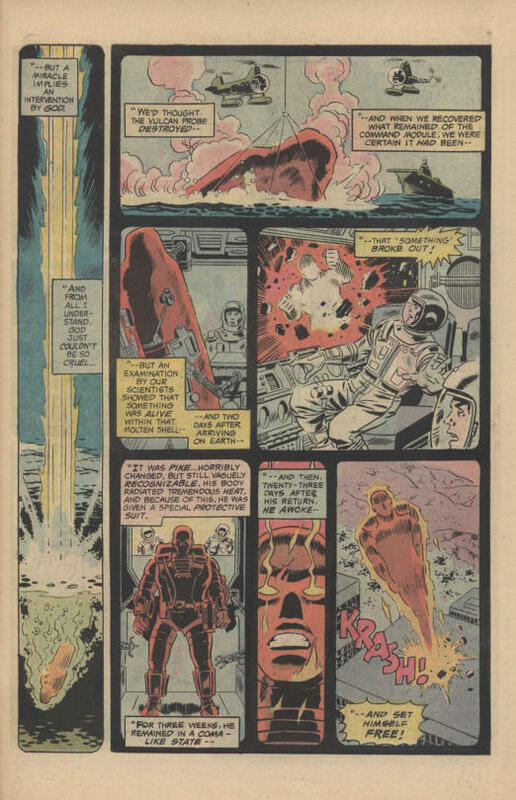 Veteran Wally Wood does the finishes, and in his typical fashion is such a strong hand that it almost doesn’t matter who the penciler was, apart from the storytelling. That’s not a bad thing, though, as Wood was one of the greats, and his deliberately Golden Age-throwback style fit the JSA perfectly. He was also the one who progressively gave Power Girl larger and larger breasts, but nobody’s perfect. The issue opens with Power Girl and the Flash working out by staging a makeshift race between the pair. this allows Gerry to lay out Power girl’s aggressive feminist stance, and to delve internally into what’s behind it–the fact that Superman kept her existence a secret for so long. 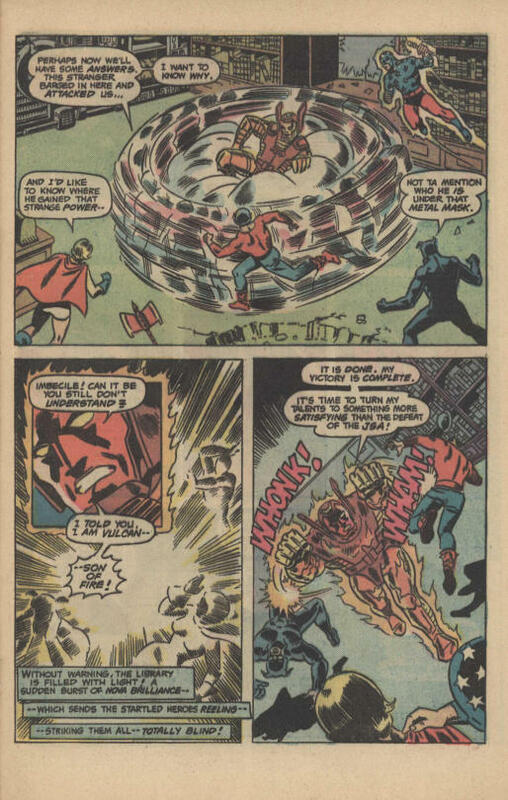 Meanwhile, Wildcat does his best ben Grimm impression as he destroys his TV when a boxing match doesn’t go the way he’d like, compelling the Star-Spangled Kid to proclaim him certifiable. The whole opening reads like nothing so much as the AVENGERS issues featuring Cap’s Kookie Quartet, who would verbally spar with one another as much as the villains. Fortunately–at least in a way–the boredom that is plaguing the Justice Society (they’re only really called the Super-Squad on the cover and in the lead-in blurb) vanishes when their headquarters is attacked by a flaming figure in armored garb, who proclaims himself to be Vulcan, Son of Fire! Elsewhere, Green Lantern is worrying about the future of his business as broadcaster Alan Scott when he is visited by Kent Nelson, Doctor Fate, who is seeking the assistance of Green Lantern on a matter of some importance. Back at JSA headquarters, the fight continues, with Vulcan holding his own against the rest of the team. He talks a lot of trash, but the reason for his attack seems vague, even to himself–and eventually, he gets bored with it, blasts the heroes with a fiery discharge, sets the building ablaze and takes off for parts unknown. Meanwhile, Green Lantern and Doctor Fate have made their way to Washington DC, where they’re briefed on the disappearance of Commander Christopher Pike–no doubt named by Gerry in honor of Kirk’s predecessor as Captain of the Enterprise. Here, Pike, inspired by the JSA, became an astronaut and flew a mission to map the surface of the sun. But mid-mission, he cracked, killing his fellow astronauts and plunging their Vulcan spacecraft towards the surface of the sun. Somehow, it had its way back to Earth, but Pike was changed by the experience. Dangerously radiating heat, he was clad in a protective armored shell, and when he eventually woke up, he went crazy and escaped. 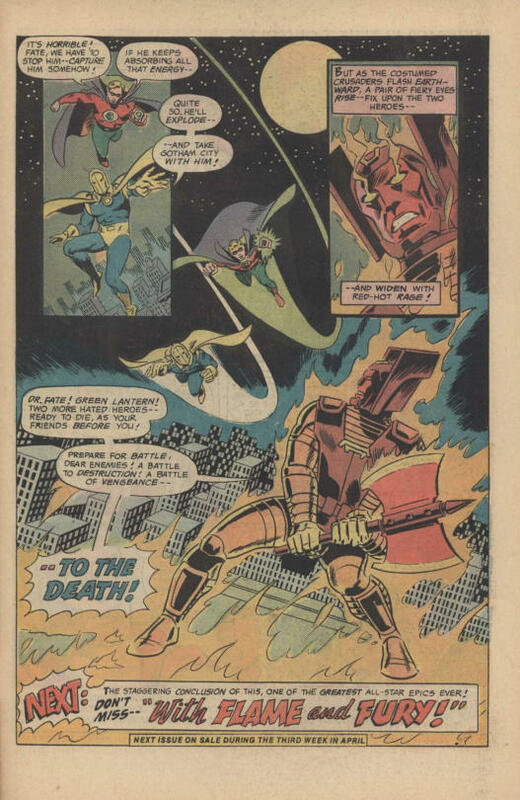 Now fully briefed, Green Lantern and Doctor Fate cut out–Fate has mystically picked up emanations from Gotham City, GL’s home town, that appear to be Pike on the rampage. Of course, he is Vulcan–and the two heroes close out the issue diving to the attack. Again, the pacing and plotting feel a lot more akin to a contemporary Marvel book, with battle taking the place of complex plotting, and character interactions depicted very broadly, in terms of types. But this was a lot more of a comfortable fit for me than the Marvel books of the period, and so I enjoyed it. The series as a whole probably did a lot to prepare me to eventually become a full-time Marvel reader later on.